← Could Frozen 2 be a much darker sequel? In 30 Disney Movies That Share A World I presented the theory that the worlds of the Disney universe are all part a big alien experiment featuring endlessly connected, repeating narratives. Wreck-It Ralph blew that theory out of the water, showing that Tangled – and therefore Frozen, Tarzan and basically every Disney favourite – are actually linked worlds in a giant computer program that plays out every time someone pays to play it again. Because Wreck It Ralph is just a game in the ‘real’ world of Big Hero 6. Spot the video feed showing Ralph falling from the ‘Niceland’ apartment tower. 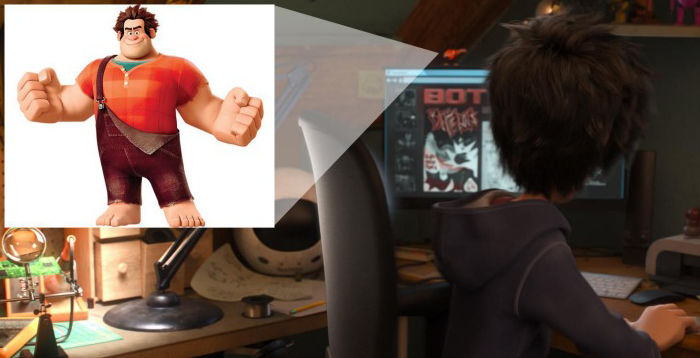 Wreck It Ralph spottings in Big Hero 6 are so numerous it would actually be hard to argue that it’s not a game in Hiro’s San Fransokyo. First there are the video screens and billboards across the skyline, which clearly advertise games from the worlds of Wreck It Ralph. Wreck It Ralph games Fix It Felix Jr, Sugar Rush and Hero’s Duty advertised on the skyline of San Fransokyo. No Fix It Felix. Hiro is clearly a fan of the underdog. …as well as the Hero’s Duty action figure that falls from his shelf on to his head. Hiro’s Hero’s Duty action figure. Never to be outdone, rich eccentric kid Fred actually has a life-size replica of the Hero’s Duty suit of armour in his room. Which has to settle it. Wreck It Ralph clearly establishes that its own world is just a collection of videogames played by the inhabitants of the ‘real’ world outside (and therefore so is every Disneyverse world that connects to it). Big Hero 6 is that real world. Big Hero 6 doesn’t just prove San Fransokyo exists in the real world. Look closely at the photos on his desk and you’ll see that the animal control officer in Bolt is in fact the dear wife of Big Hero 6‘s police desk clerk. This means that Penny and Hiro, Bolt and Baymax all exist in the same America, where almost every other world in the Disneyverse is part of an elaborate interconnected fiction. Oh the Hans paradox you ask? How can Hans be an ancestor of Fred’s rich and prestigious family? There can’t be two men in any universe who can look that smug. Or is Hans really a distant relative of the family? 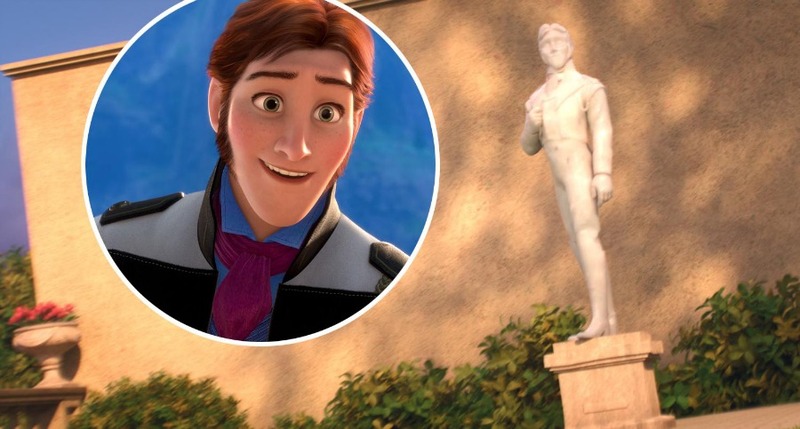 Can Frozen‘s Hans be the great great great… grandfather of Stan Lee? Fred’s family photo, including his father – the one and only Stan Lee. But how could he be? 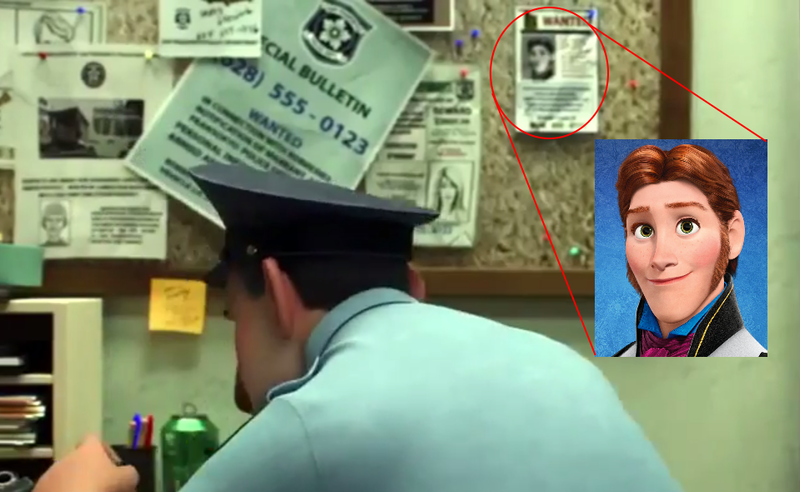 Hans exists in the fictional fantasy world of Arendelle, not the ‘real’ city of San Fransokyo. But what if he escaped? What if he got out? What if Hans has found a way to exploit a secret of the universe to his own advantage? A secret that allows Vanellope to teleport and Genie to visit Disneyland. What if Hans is a time-travelling, reality-warping outlaw wanted in both his reality and the world of Big Hero 6? The sketch artist really captured his smarm. This entry was posted in The Disney Theories and tagged Big Hero 6, Disney, Enchanted, Frozen, Games, Head Canons, Movies, Theories, Wreck-It Ralph. Bookmark the permalink. What if the young ‘Moppet girl’ in Wreck Ralph (the girl that plays the games) is actually Honey Lemon? They are both blondes,and have pink glasses. That’s kind of where the similarities end, but it’s a possibility. I like where this is going. I also think you can connect this to Once Upon A Time. In the episode “Best Laid Plans”, It’s revealed that different authors record what happens in the Enchanted Forest and can also manipulate it. When listing different people who were once authors, one of the names was “Walt”. So maybe that shows that Storybrooke is a part of the real world along with Big Hero 6 and Bolt. This will probably make you happy: Big Hero 6 was originally a Marvel comic. The movie is an extreme departure, but it’s still based off a Marvel comic. 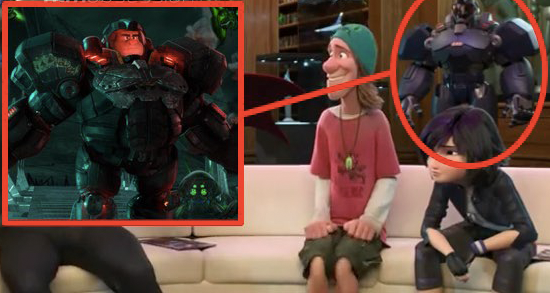 I know this is really far fetched, but what if Russel from Up, is Tadashi and Hiro’s father? I mean, there is a photo of Tadashi’s parents, (it’s hanging on the wall in Big Hero 6) and think about it… They wear hats, Tadashi could have inherited this from his father, and the hair style is the same. They are both Asian. (Sorry if offensive) Tadashi and Hiro have this nationality from their FATHER. Just a theory. Here’s what I think: For some reason, Flynn Rider has a video game made about their journies. Rapunzel stull exsists in both worlds. From what I’ve seen of this website, it’s all about Disney’s animated movies but since they included Big Hero 6 which is based on a Marvel Comic (like someone already pointed before), does it mean that Disney’s movies could be included too? What I mean is that Big Hero 6 is for exemple supposed to be the japenese alter ego of Marvel’s Avengers in the Comics. But now that Disney bought Marvel is’nt it all connected then? I know they changed the name Tokyo to San fransokyo but still, I wonder… And what about pirates of the caribbean and all the others then? 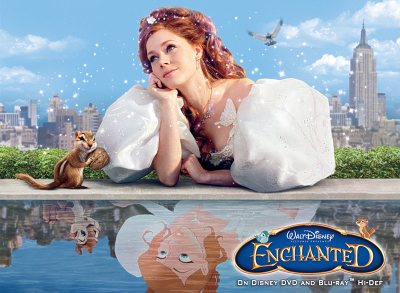 Even Enchanted tends to prove than movies and animated movies can be part of the same Disneyverse. Of course at first they probably didn’t meant to link everyting but it doesn’t mean it’s not possible and all the theories prove it. And about Hans isn’t it possible that Frozen, Rapunzel, Mulan etc. did existed in the “real world” and they simply made films and videogames in their honnor after they died? After all a lot Disney’s animated movies are inspired from real stories like Pocahontas. Why couldn’t it be the same in the Disneyverse? I don’t know if I made my point here but it’s only ideas I got reading some articles. I had forgotten to add but Stan Lee is actually the creator of many Marvels (you can check him up on Wikipedia) He appeared in a lot of Disney/Marvel’s movies (Guardians of the Galaxy, Iron Man, Avengers etc. ) and tv shows as different characters… That’s why I think it could be linked to Disney’s animated movies since he also appeared in Big Hero 6. Of course you wouldn’t know if you’re not a fan of Marvel and Disney at the same time but I think it could be interesting to look more into it. It is so funny though. Have you realised that in Big Hero 6 that both Fred and the one and only; Stan Lee, are fanatics of games and superheroes and villains alike? I mean the final scene of Big Hero 6 leads Fred to discover that Stan Lee was in fact a superhero fanatic/actual superhero? Would this not then solve and actually prove your theory correct? I mean therefore this technicality may be small, it shows how they are linked as father and son as well as the fact that they create suits based on superheroes? I like your theories because in fact it has always been a paradox to me about the whole Disney-verse. Also please reply if you have any questions from my point of view and I will be happy enough to explain where I am coming from. If any movies take place in the real world, they are live-action. “they both wear hats” lol…. although, I really want Russell to be connected to this movie, just because I love both.